1 garlic clove minced, can help lower blood pressure & the risk of some cancers. Skiers! Garlic thins the blood – so it could help with altitude acclimatization. Heat oils in skillet over medium heat. Add garlic & ginger, sauté for 5 min, stir frequently. Add celery, carrot & chicken, cook 5 min or until chicken is cooked. 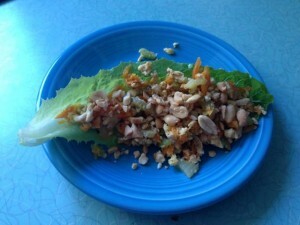 Spoon mixture into cold romaine lettuce leaves & sprinkle with peanuts. I used ground turkey. 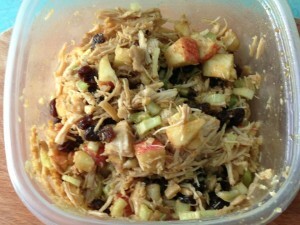 It tasted great; however, I think this recipe will be more flavorful with ground chicken. 1/2 cup sliced red peppers, more vitamin C than citrus fruit, loaded with vitamin A which support the immune function & protect from cell damage, inflammation, cancer and aging diseases. 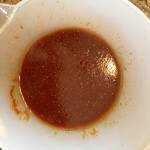 Mix oil, lime juice, soy sauce, sugar & chile flakes. 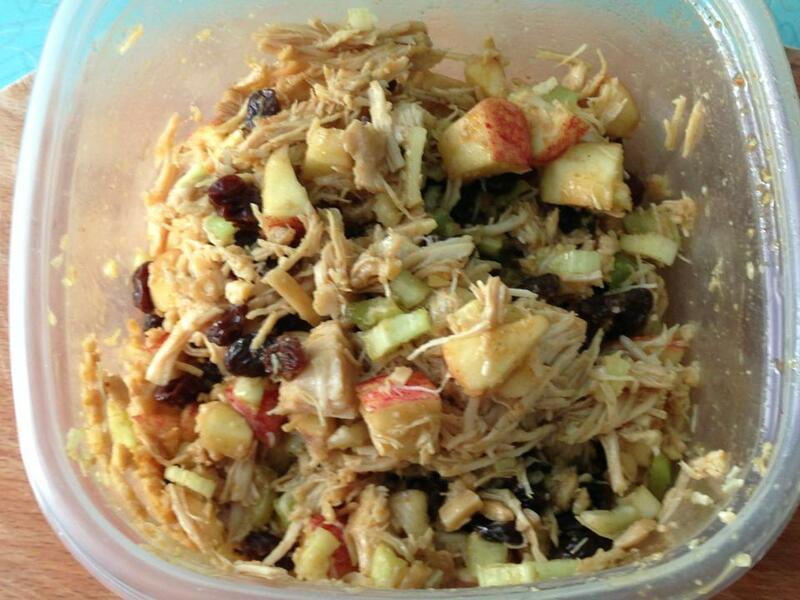 Put pork in bowl & add 3T dressing, broil for 7 min/each side. 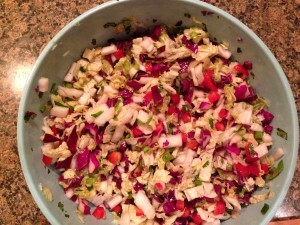 Serve slaw topped with chop. Add 1T water & blend. 2T toasted pumpkin seeds, a rich source of protein – 6 grams/ounce, low in fat, good fiber source, helps keep blood cholesterol levels down and plays an important role in muscle contractions, blood clotting & regulating blood pressure. Soak raisins in warm water for 10 minutes. Combine all ingredients & add curry dressing. This salad tastes great on a whole wheat pita pocket. What I like best about each of these recipes is that you can make a nice big batch and have it for dinner one night and lunch the next day. These items will travel well, too. So a great option to take up to the mountain in the winter. Each salad has such great flavor and aroma to them that if you fixed them up in the winter it would remind you of summer. My ski friends rave about my hummus recipes. Hummus is so easy to make, easy to pack up and take with you. When we are on the mountain teaching lessons we need easy to grab food when our lunch breaks are short. Hummus is perfect just add any vegetable or your favorite “healthy” chip – our favorites are carrots, cucumbers, snap peas, celery, broccoli and cauliflower. 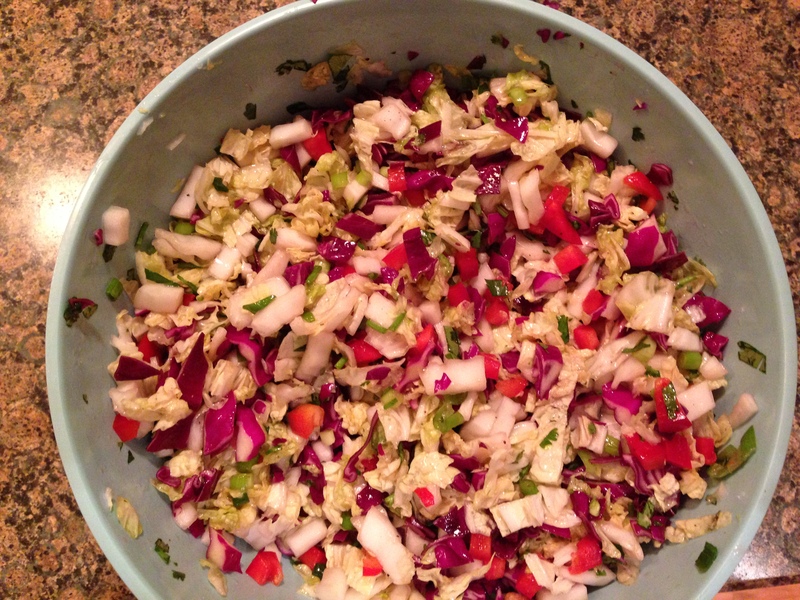 Team up hummus (protein) and veggies (carbohydrates) for a great healthy mid-day snack! As for chips – I love the quinoa or sweet potato tortilla chips at Trader Joes and their sesame rice crackers. ¼ cup lemon juice, vitamin c source to help heal wounds, grow and repair blood vessels, skin, cartilage, ligaments, tendons, bones and teeth, as well as, fight off heart disease, inflammation and cancer. Drizzle the last 3 ingredients over hummus. Spice it up for summer! Add a palmful of cilantro and 1 seeded jalapeno pepper. Or try basil! 1 clove garlic, minced. I always add more…. Blend all the above ingredients and add 2 tablespoons of the reserved black bean liquid. 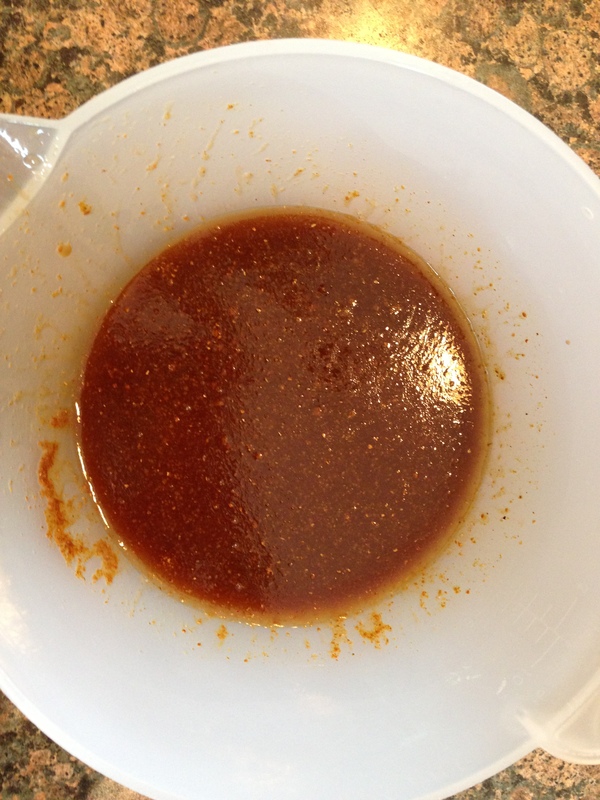 My most used and favorite recipe is “Easy Lime Marinade”; it can be used for chicken, fish or shrimp. 1 garlic clove, minced. I always add more! Wisk the above ingredients until they become blended. Pour over your meat and let sit for 15-30 minutes. I hope that you enjoy these recipes. I selected these because they taste great, are healthy and do not take a lot of time to prepare. Perfect for hot summer nights, yet, will taste great on the mountain this winter for my lunch breaks. Let me know what you think! Summer PEAK fitness NW Ski Conditioning programs have begun, in the Portland Metro area! You can still take advantage of the 2 for 1 Outdoor Fitness Training special. Go to www.peakfitnessnw.com/events for all the details! August sessions begin the week of August 5th; no classes the week of July 29th. If you have any questions on how you can kick-start an active lifestyle that incorporates the outdoors contact Jennifer Lockwood. She can be reached at jenn@peakfitnessnw.com or 503.913.8385.